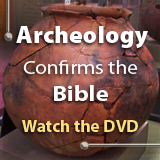 If archaeology and prophecy have proven the Bible to be true, then why is it a point of so much controversy? The ancient city of Petra was virtually unknown to archaeologists, with only the Bible to give account of its existence. But 200 years ago all of that changed when one man made a legendary discovery. A Biblical prophecy accurately foretold the history of the ancient city of Tyre. Are the Bible's stories about Egypt simply mythology as critics suggest, or is there proof in Egypt's own ancient writings? Babylon was excavated in 1898. The archaeological findings point to the truth of Scripture's prophecies about that great city.